Cards, Candi and Cupcakes: Clearly Besotted Challenge #2 - Spots and more spots! Clearly Besotted Challenge #2 - Spots and more spots! 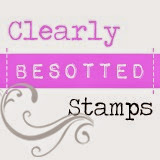 I love spots, dots and polka dots and have been having fun with my fab new stamps from Clearly Besotted, I just love them all and have collected quite a few now.... intend to have them all one day, lol! Clearly Besotted Challenge #2 - more spots! Baking in this heat - crazy! !